Personally, 2014 has been quite a year. As is typical of early-career life in academia, I’ve moved around the country adapting myself to various opportunities not quite of my choosing. But it’s also been a year in which I’ve stopped trying to get myself into an ideal situation for putting my numerous plans into action and started getting on with them anyway. The difference is that, until I was appointed to my previous temporary teaching post, I really had no confidence that I could do the job. 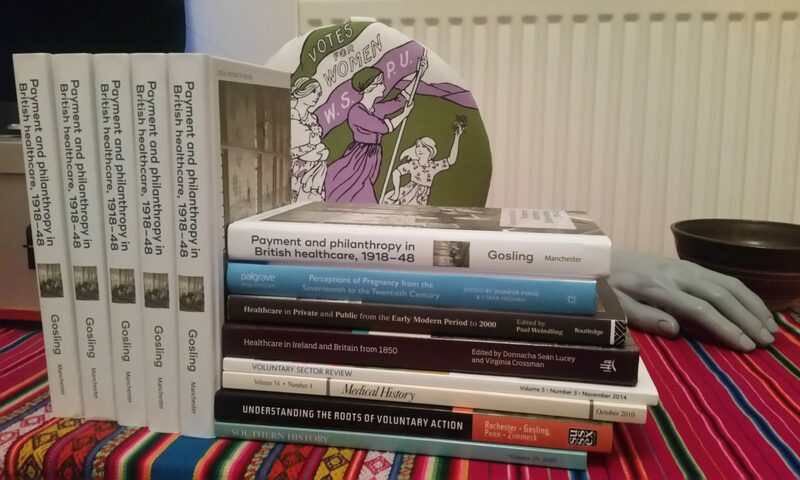 In that post, I wrote from scratch four new History modules, overhauled existing undergraduate and postgraduate modules and chaired some team-taught by those far more senior than me. When I finished my PhD I knew I had some solid research and something to say. I knew I could deliver a half-decent lecture or seminar, but I didn’t really know if I could pull it all together. By the time I left that post after two years, I knew I could do the job and do it well. What I had only begun to get to grips with by the end of my first full-time teaching post, and I have started to make far more central in 2014, is juggling that with the research and writing that is also so crucial to building an academic career. Over this past year I have co-written two essays for edited volumes and had my own book proposal accepted. Job hunting and then getting used to a new job have both been notable distractions, but by the end of the year I’m beginning to feel like this is now a natural part of how I work. It’s been a year of unsurprising disappointments. Mine were among the vast number of postdoctoral project proposals turned down and my only interview for a permanent job was unsuccessful. And these disappointments have forced me to step back from initiatives I got off the ground on a number of occasions. But it’s also been a year of unexpected successes as well. The only other interview I had was for a part-time teaching position at the University of Warwick, after which I was offered a full-time post in an area where I thought of myself as less qualified. (In fact, I’ve loved working in such a great department and taking a side-step in my teaching has helped me rethink my own research in broader terms.) And I was also offered two additional positions out of the blue. Consequently I’m working for Professor Pat Thane on researching the official history of the Child Poverty Action Group for their 50th anniversary, and in the new year I’ll be a Visiting Lecturer at Cass Business School, playing a supporting role to Dr Peter Grant in running the MSc specialist pathway in Grantmaking, Philanthropy and Social Investment. What I’ve achieved in 2014 is not what I would’ve put on a list at the beginning of the year. In short, that would have said ‘find a career’. What I was hoping to do then was all about doing what was necessary to convince somebody else to give me a steady position from which I could slowly work through my own professional to-do list. While that hasn’t happened, over the course of the year something else has. Instead, I seem to be ‘making a career’. Cobbling together paid and unpaid work across the disparate threads of what I’m interested in, what I can do, and what is useful to those willing to pay me. The instability this ensures is grinding and does nothing to bring my sister the cousins she wants for her boys, but it does seem to be working – for now at least. The reason it works is that it does have a solid platform. Not the permanent position I was hoping for, but a level of confidence I simply didn’t have two or three years ago. It’s something I lost during a period of depression during my doctoral studies and it’s only returning now, in a different fashion and probably much more deserved, nearly half a decade later. And what it’s serving as a platform for is a more intellectually eclectic working life than I had thought possible. This eclecticism has also been expressed in my blogging, which I’ve embraced as an online embodiment of my wandering mind. I’ve been chipping in on much-debated subjects: approaches to transnational history; and identifying areas where surprisingly little work has been done: the history of charity shops. I’ve also blogged a lot more about my teaching and this is something I plan to continue, as I slowly develop the advice for students section of this website. Casting an historical eye over political proceedings, however, has featured less heavily in my blogging than in previous years. Comments on David Cameron’s civil society agenda or Labour campaigning on the NHS have been few and far between, perhaps reflecting a mainstream politics stuck in a holding pattern while alternatives in the form of the SNP, UKIP and the Greens make the running. Offering the same historic treatment to these new actors is a rather different task, although perhaps one I’ll need to get to grips with in 2015. I’ve enjoyed your blog enormously – you’ve made one new fan/admirer at least. Speaking as someone who was also seeking a start in academia, I can say that you’ve done enormously well. I look forward to more from you in 2015!